Fresh and super tasty! 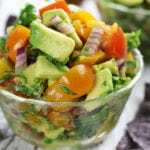 Our family can make a meal out of this Chunky Guacamole Salsa with chips. 1 med jalapeño *roasted & diced. Remove seeds for less heat. Prepare first 7 Ingredients and add to a large mixing bowl. Stir well. Add in diced avocado, salt and pepper and stir until just combined.